We're taking the next 8 weeks over Lent to stretch ourselves and extend the hand of compassion to our communities. We're so excited to see what the Lord is going to do!! Each week we're setting ourselves challenges which will be posted on this page. Take a look at each week's ideas and pick one that ideally stretches you a little, and then do it!! Remember that we grow as we stretch. We're expectant that you'll see God at work each week and we'd love to hear your stories of what happens. Do send stories to us here, twitter (using #LiveCompassion), facebook, or writing on the back of the postcard. 1) Look back at the previous weeks’ ideas and pick one that you thought was too risky at the time. And then do it! 2) If you’ve been tracking with some of the riskier ideas, pick something a little bit more stretching and give it a go! 3) If you’ve been tracking with the most stretching ideas, go compassion crazy! What’s the most generous thing you could do? Give it a go…..
1) Bring an item of non-perishable food for Storehouse with you next weekend, and start / continue a weekly habit. 2) Sign up to be part of a Storehouse team – Thursday team, Saturday team, café, allotment, Lighthouse (women’s) project, homeless ministry, money management, etc. 3) Go out into your community, look for someone in need & bless them in some way. Maybe buy a copy of the Big Issue, chat to the seller, and let them know that God loves them! 2) Give a gift to a mum you know… but not your own – you may well have done that anyway! Increase the risk by choosing a mum that doesn’t know Jesus yet. 3) Do something practical to serve a mum that you know e.g. cook them a meal. Or give a gift for a babysitter so they can do something they can’t normally do, e.g. go out for an evening. Remember single parents. 2) Do something practically compassionate for someone that you don’t really know, maybe a neighbour you’ve not connected with much before. Could be a homemade cake, help putting their bins out, an invite for coffee. Go for a prayer walk in your neighbourhood. Go with others if you can. What is the Lord saying to you about your area? What do you dream of being different? Go for a prayer walk in your neighbourhood. Go with others if you can. Dream as you go. Look specifically for someone to have a conversation with, and if possible, ask to pray with them. 1. Bring an item of non-perishable food for Storehouse with you next weekend, and start / continue a weekly habit. Could you invite someone to the Alpha launch? 2. Do an act of kindness for someone that you know is in need – maybe someone at Riverside, maybe someone in your community. Could you invite someone to the Alpha launch? 3. Look for someone who’s rough sleeping / homeless &amp; bless them in some way, e.g.with a hot drink, some food, etc.. Could you invite someone to the Alpha launch? 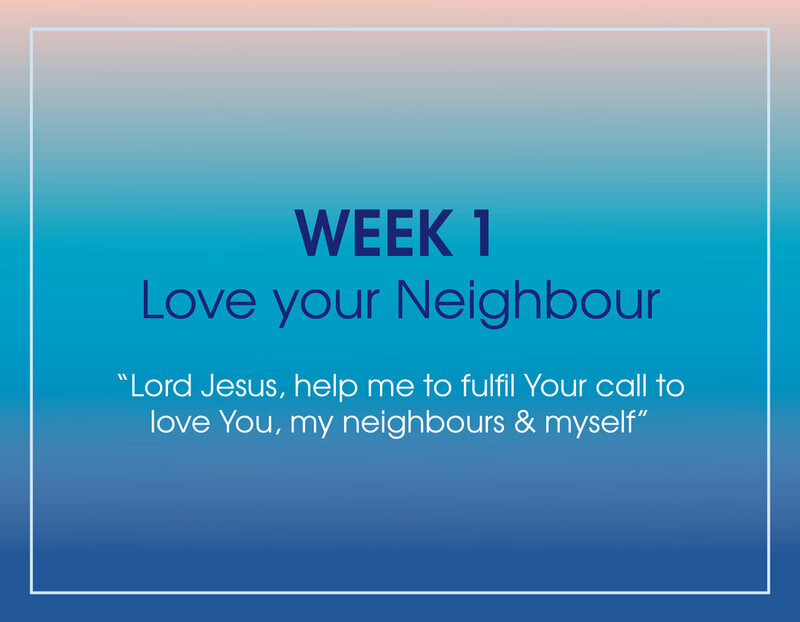 Make a note of your 6-8 closest neighbours & pray for a different one each day this week. Could you invite one or more to the Alpha launch? If you don’t know the name of one or more of your 8 nearest neighbours, try to find out – maybe knock on their door &amp; introduce yourself! Could you invite them to the Alpha launch? Is there something practically compassionate you could do for one of your neighbours e.g. bake them a cake, do some gardening, wash their car? Could you invite them to the Alpha launch?